Closed rhinoplasty requires surgeon’s strong anatomical knowledge combined with years of surgery experience. Traditionally, only the best rhinoplasty surgeons perform the closed rhinoplasty surgeries. Upon careful examination your surgeon will decide if the closed rhinoplasty procedure is right for you and will provide enough access and visibility for the surgeon to reach the desired effect. There are multiple benefits to choosing closed rhinoplasty vs. open procedure. 1. Minimal infection risk to the patients, especially older ones. 2. More predictable results visible almost immediately after closed rhinoplasty vs. open surgery. 3. Less post surgery scarring of nasal tissues. 4. Dramatic reduction in rhinoplasty swelling after surgery. 5. Faster surgery and recovery times. 6. 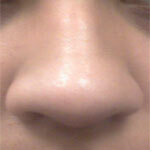 Closed rhinoplasty cost is less due to recovery and surgery time savings. 7. Fewer reported cases of rhinoplasty gone wrong after closed rhinoplasty procedure. Closed rhinoplasty procedure is performed under general anesthesia but the recovery times are significantly shorter and patients can return to work and normal life much faster than after the external procedure. However, in certain cases of nose traumas or severe deformities closed rhinoplasty procedure would be inappropriate and your surgeon might recommend you undergo an external rhinoplasty.